John Montagu, the 4th Earl of Sandwich, is often credited with the creation of the sandwich; however, he most likely was not the first person to enjoy ingredients squished between two slices of bread. But the 4th Earl of Sandwich’s love of the easy meal succeeded in giving a nickname to this affordable cuisine. Soon after, the sandwich swept the world, offering almost an infinite number of variations. "Eliza Leslie's 'Directions for Cookery' (1837) listed ham sandwiches as a supper dish, but it was not until much later in the century, when soft white bread loaves became a staple of the American diet, that the sandwich became extremely popular and serviceable. By the 1920s white loaf bread was referred to as 'sandwich bread' or 'sandwich loaf.'" Otto Frederick Rohwedder invented pre-sliced bread and a way to keep sliced bread fresh in 1928, and that continued the trend for sandwiches. In fact, after the invention of pre-sliced bread, more bread was consumed in the United States, leading to an increase in sales of spreads and jellies to place on top of the bread. Wonder Bread was invented in 1930, Welch's grape jelly was invented in 1923, Peter Pan peanut butter was invented in 1928, and Velveeta cheese was invented in 1928. Today, the sandwich is an essential part of Southern cuisine. Bologna sausage is finely ground pork with no visible pieces of lard in the bologna, according to food laws in the United States. Like hot dogs, bologna sausage is uniform in appearance and made of many pork trimmings. Many Southerners remember snacking on bologna during their childhood yet, originally, bologna came from Bologna, Italy, not from the United States. However, if you try to order bologna in Italy, you won't get bologna. Instead, you'll receive mortadella, a thick Italian ground sausage considered to be closely related to bologna with visible bits of lard and peppercorns. While bologna sandwiches, or “baloney” sandwiches as some spell it, are common throughout the United States and Canada, the fried bologna sandwich is a distinctive favorite to America’s South. Considered the "poor man's steak," the fried bologna sandwich is simply a hunk of bologna fried on the grill and slapped between two slices of white bread. Some use mayonnaise, some use mustard, and some use both. While you can find fried bologna sandwiches at almost every diner in the Southeast, leave it to a Chicago restaurant to make the humble sandwich an over-the-top delicacy. At Au Cheval, it fries thin slices of housemade bologna, layers the bologna with melted yellow cheese sauce and mayonnaise, and places it on a griddled bun. While collard greens are a common Southern side, many have never heard of it served as a sandwich. As chef Todd Richards jokingly stated at the Atlanta Food and Wine Festival in 2016, you can tell who is actually from the South by who eats collard greens. This sandwich is simply served with cooked collard greens between two griddled hoecakes, or flat cornbread pancakes. The combination makes sense because most Southerners dip their cornbread into collard greens so that the crumbly cornbread soaks up the pot likker. Pimento cheese sandwiches are the South's most iconic sandwiches, even served famously at the Masters Golf Tournament in Augusta, Georgia, each year. The spread is relatively simple: sharp cheddar cheese mixed with lightly spicy pimento peppers, cream cheese, and mayonnaise, all liberally slathered on white bread. It is a spread practically unknown to the rest of the nation, but essential in the South. Yet, pimento cheese is not Southern in origin. Pimentos, which is a type of sweet pepper related to the bell pepper, were imported from Spain in cans until 1908. Emily Wallace, a graduate student at the University of North Carolina at Chapel Hill, believes that a 1910 book, "Fancy Cheese in America," contains the first pimento cheese recipe, consisting of mixing New York's Neufchâtel cheese with diced pimentos. The recipe came from a Danish immigrant to New York. While some may argue that Florida isn't really a part of the Southeast but rather its own separate entity, the Cuban sandwich’s origin remains unknown and contested to this day. Some believe the Cuban was created in Cuba, and others claim that the sandwich’s origin was in Tampa, Florida. In the late 1880s, huge groups of Cubans immigrated to Tampa, settling in the Ybor neighborhood. Coffee carts shuttled coffee and the pressed sandwiches to factory's female workers since women were discouraged from going to the general cafeterias. The city council of Tampa even declared the Cuban as Tampa’s signature sandwich in 2012. It is generally agreed that the Cuban sandwich includes Cuban bread, mustard, sliced roast pork, glazed ham, swiss cheese, and thinly sliced dill pickles. Tampa residents typically include salami layered in with the other meats, while those in Southern Florida leave this ingredient out. Some even include mayonnaise, lettuce, and tomato, but many believe these additions would not make a “true” Cuban sandwich. 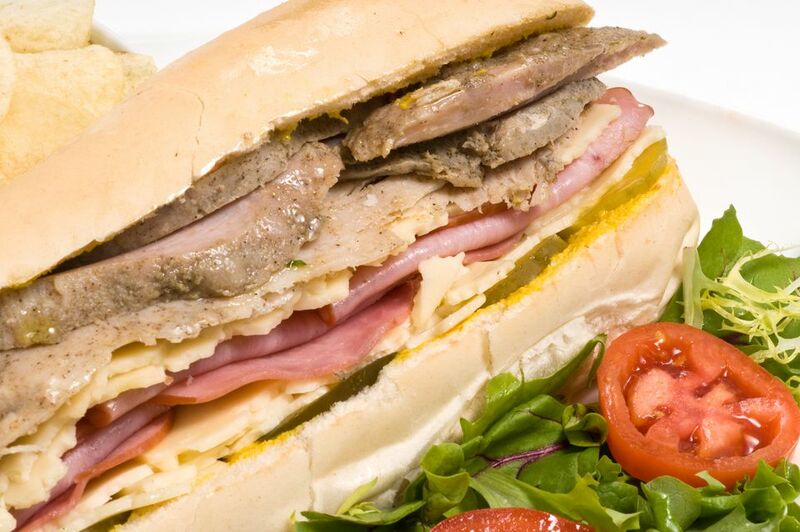 Every year, Tampa hosts a Cubano festival where entrants compete for the best-pressed sandwich. USA Today's 10Best has named Michelle Faedo's On the Go as the best Cuban sandwich in Tampa. The Southern tomato sandwich is exactly that: a juicy slice of tomato layered on mayonnaise on top of white bread. That's it. No meat, no lettuce, nothing fancy. The key is its simplicity and finding delicious, seriously fresh tomatoes found in the peak of summer from gardens in the South, where tomatoes are so plentiful that gardeners push them on their neighbors. The tomato is traditionally cut thickly, layered with Duke's Mayonnaise (a Southern institution) and placed between two slices of white bread. Juice dripping is perfectly acceptable and eating it over the sink is often the norm. The tomato sandwich is Duke’s signature recipe, “the quintessential meal that Duke’s graces,” Duke's associate brand manager Erin Corning says—above all, because “it doesn’t require a whole lot of instruction.” Duke's mayonnaise contains no sugar, allowing the sweetness of the tomato to shine in this very simple and iconic sandwich.